Our product range includes a wide range of 3d sublimation coil, 10 mm mug tape, big mug coil, heat resistant tape, silicon pad (15 x 15 inch) and small mug coil. We are engaged in providing a wide array of 3D Coil to our valuable customers. We are engaged in providing a wide array of 10 mm Mug Tape to our valuable customers. 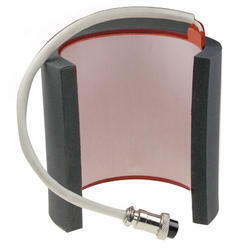 We are engaged in providing a wide array of Mug Coil Small to our valuable customers. The Sublimation Ink are a disperse dye suspended in a liquid solvent, like water. The images are initially printed on coated heat-resistant transfer paper as a reverse image of the final design, which is then transferred onto polyester fabric in a heat press.